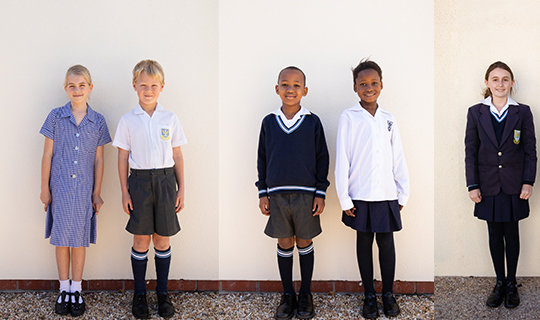 Kirstenhof Primary has a complete range of school uniform. The school believes very strongly that children should wear the correct uniform and wear it with pride. The uniform has recently been updated reflecting a more modern look which emphasises comfort and instils the values of the school. The uniform is detailed below and all non-generic items may be bought at the school Clothing Shop. Black shoes are worn year round. The school jersey can be worn year round. The KPS tracksuit is a required uniform item for Gr 1 – 3 children, as it is regularly worn during the school day. The school golf shirt and shorts/skort is required for Physical education or Ball Skills.